Dark skin under your arms can be an embarrassing condition, but there are several treatments that can alleviate the discoloration. The proper treatment method may depend on the cause of the discoloration, and in some cases, routine preventative maintenance or changes in habits can make the dark skin go away without any additional treatment. Some causes of dark underarm skin are medical, such as acanthosis nigricans, a disorder that causes dark streaks along the armpits, neck, groin and other areas, according to the Mayo Clinic. This condition is a result of high insulin levels, which are often associated with obesity, pre-diabetes and type 2 diabetes. Another skin disorder, hyperpigmentation, causes excessive production of melanin, which may manifest as darkened underarm skin. But underarm discoloration may also be related to external causes, including adverse reactions to deodorant, excessive use of depilatory creams, the build-up of dead skin cells, excessive sweating and friction caused by clothing or shaving. 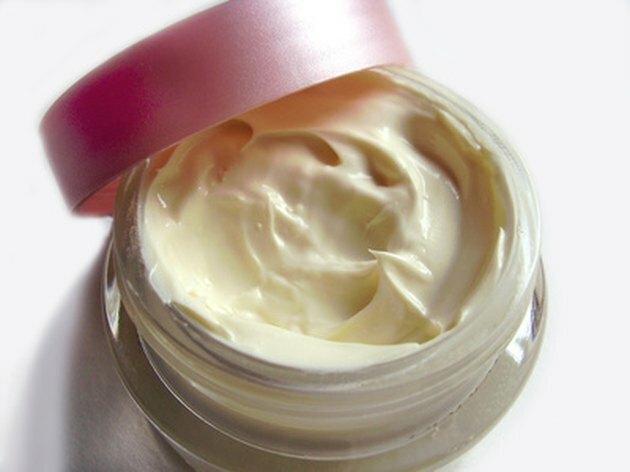 There are several commercially available topical creams and ointments designed to lighten skin tone. Usually marketed as skin lighteners or skin-bleaching agents, such solutions can contain a variety of active ingredients, according to the New Zealand Dermatological Society. Common active ingredients include hydroquinone, retinoids, corticosteroids and mercury, and many of these solutions are sold with directions to avoid using them continuously for more than six months. Some solutions may take several weeks for an improvement to be seen. These products often work by reducing or inhibiting the production of melanin, the skin's natural pigment enzyme. According to Rekha Deshpandey's book "Home Remedies," other at-home treatments for lightening dark underarms include applying vitamin E oil or baking soda immediately after a shower. You can also make pastes from common household ingredients that may lighten the skin when left to dry in the armpits for about 30 minutes. One recipe calls for a teaspoon of lime juice, a teaspoon of cucumber juice and a pinch of turmeric. Another recipe calls for a tablespoon of plain yogurt, a teaspoon of gram flour, a teaspoon of milk and a pinch of turmeric. If you're willing to invest a little more money and endure a short recovery period, there are some procedures that can help balance underarm skin tone. Chemical peels using alpha hydroxy acids and beta hydroxy acids can remove the outer layer of skin to reveal brighter skin beneath, according to the skin-care website Care Fair. The American Osteopathic College of Dermatology advises that Q-switched ruby lasers can be used to remove pigment without scarring, and the Mayo Clinic reports that both laser therapy and dermabrasion may be appropriate for some conditions, particularly acanthosis nigricans. To best avoid getting dark underarms from external causes, you should ideally wax your underarm hair rather than shaving, according to health and beauty website The Beauty Brains. You can also shop shaving altogether or just shave very carefully, always using shaving cream and changing your blades as soon as they become dull. "Cosmopolitan" magazine recommends wearing loose tops and cotton layers beneath scratchy fabrics to avoid chafing. Acanthosis nigricans can usually be prevented by maintaining a healthy weight and managing your insulin per your doctor's advice. Hyperpigmentation cannot always be avoided, but regularly wearing sunscreen and limiting direct sun exposure can reduce the risk of certain forms of the disorder.